How about a cheap furnace cleaner person (besides the big companies like DA Bennet) &/or who does home energy audits? We'll tag general furnace tuneup/maintenance onto Jen's question (that reminds us, we need to get someone to do that...). I never thought about having just some general person over to clean our furnace! Ha! I know they're a big local company but I've been using Main Care since 1999...they're at least employee owned which is cool...I've had a lot of the same people over to my house for routine stuff over the course of that decade+. A place with good employee retention is usually a good sign. 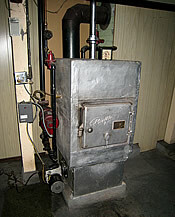 They're not cheap, but I always use Crisafulli Brothers to service my furnace because I know they'll do a great job. We've been doing business with Family Danz Heating for more than 15 years. I definitely recommend them. Zerodraft of the Capital District, Comfort Home Improvement, Polsinello Fuels, all are part of NYSERDA's Home Performance with Energy Star program, so they could all do furnace maintenance and an Energy Audit. If you contact NYSERDA's Green Jobs, Green NY program you can sign up for a free audit with one of these contractors. John Duncan Plumbing & Heating, Colonial Ave, Albany. One man band, won't break the bank. DONT give Roland J Down (or whoever the company they sold out to) your phone number... they will call you EVERY week. Literally... theyve called once a week for two years. I just ignore the number now. I'd get calls in the summer for a central air tune up (I dont have central AC) and in the winter for a furnace tune up less than a week after they came and did it. The work they did was fine, but its not worth being harassed. Check out the NYSERDA program. I believe it's gotten significantly better since I participated. I had an energy audit done with Summit Construction (http://www.summitconstructionofny.com/index.html). Pete prepared a report and then gave me some improvement options with payback calculations. I did 2-3 things on the list, including air sealing (big bang for little money) and added blown-in insulation. Those two things made an enormous difference both in the comfort of my house as well as dropping my energy bills. At the time, I got a big rebate check from National Grid for the air sealing portion ($600, which basically covered that item) and then 10% back on the total cost from NYSERDA. Not sure what the deals are now, but I think they will cover the energy audit or nearly all of it. It was ~$400 when I had it done. I think you can get it done now for $50. IT's worth it, particularly if you have an older home. Bourque Mechanical (465-7524) has installed and serviced all our mechanicals (furnace, hot water, central air) since 2000. All techs well and professionally trained. Bourque is a good value for the quality of service they provide. I was very surprised to have arranged a boiler tune up with( I thought ) Roland J. Down Co. and have arrive at my house Service Experts. I was not given a comprehensive or ,really good answer, as to what happened, but I am now wondering what happened and should I trust this Service Experts. They did the tune up, it wasn't the young man's fault after all, but I can find nothing online about this development. I would appreciate any advice/information about this. @Eileen Glasheen: I don't think this was a scam. A few years ago, the locally-owned and operated Roland J. Down became a unit of Service Experts, a national HVAC service company. Service Experts is, in turn, owned by Lennox International. The same thing happened to D.A. Bennett. This is the age of conglomerates.